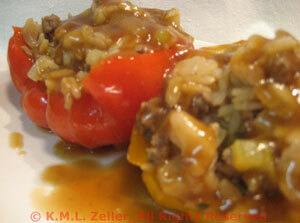 Thyme for Cooking Dinner tonight: Stuffed Bell Peppers, Oriental Style. Use any color pepper you like; I usually use red and yellow. These are cooked in the skillet rather than baked.